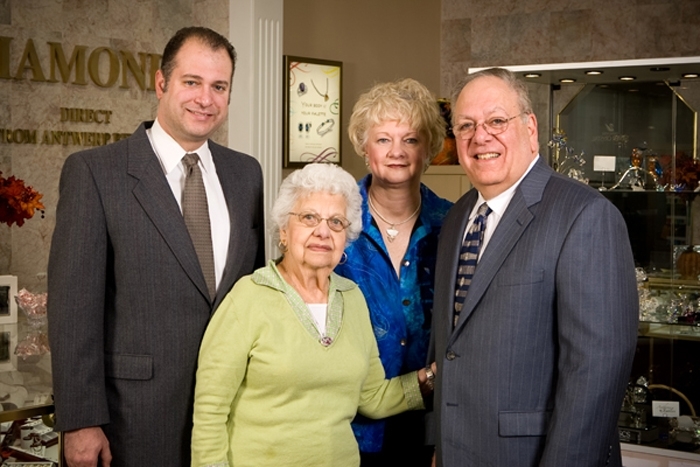 Anthony Jewelers is a 3rd Generation family business serving the Riverfront communities and beyond since 1953. We are a full-service jeweler, specializing in Engagement Rings, Loose Diamonds, Custom Design, and Jewelry Repair. With two graduate gemologists on staff, we are happy to help you with all your jewelry needs. In 1934, at the age of 17, Anthony Fratto, Sr. learned the trade of watchmaker by apprenticing under his uncle. His first job in the industry was on Jewelers' Row in Philadelphia, the country's oldest jewelry district. 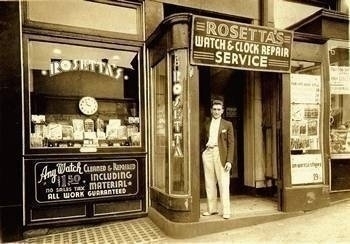 He then owned a small watch repair shop, called Rosetta's, on Market St. (The picture below shows him standing in front of this shop.) During World War II, he used his refined hand skills to help build equipment for the war effort. After Anthony Sr.'s death, Anthony Jr. took over the day-to-day operations of the store. In 1991, he made the decision to join the Independent Jewelers Organization (IJO). That is when Anthony's began to morph into the store you see today. As an IJO member, we started making semi-annual trips to the diamond capital of the world: Antwerp, Belgium. It was in Belgium that Anthony established our important relationships with some of the world's leading diamontaires. In 2006, Anthony passed the torch onto Nick who now manages the store operations. He is the one responsible for all the beautiful jewelry you see in our cases and our relationships with the designers and manufacturers we work with. The expertise of the Fratto family is supported by a staff that includes AGS and GIA trained sales associates. We invite you to join with us as our story continues to grow. We would love to help you celebrate the new chapters in your story.